The Kushans, or Kushanas, were said to be an offshoot of a branch of the Yueh Chi tribe following their mass exodus from China in around 165 BC. In all, there were five branches of the Yueh Chi. One of their leaders, Kujula Kadphises or Kadphises I (c.AD 30-80), united these five tribes and led a campaign down south, at a point sometime in the first century AD. He encountered the Scythians (Sakas) who had already put down roots in India. The Sakas were a Central Asian tribe which, along with the Indo-Parthians (Pahlavas), had dominated India from present day Afghanistan and Pakistan right over to parts of Maharashtra and Kathiawar (modern Gujrat). Kadphises subdued the Sakas and established his kingdom in Bactria and the valley of the River Oxus. He further captured Gandhara and southern Afghanistan. Kadphises I lived to the ripe old age of eighty, and was succeeded by Vima Takto. Vima conquered north-western India and appointed a general to supervise it (as per the Chinese chronicle, Hou Hanshu, which provides much of the details on the Kushan empire). Vima Takto was succeeded by Wema Kadphises, otherwise known as Kadphises II (c.90-112 or c.105-127 - dating for the Kushans is very difficult and few scholars seem to be able to agree). Wema was the grandson of Kadphises I, and either the son of Sadakshana, probably another son of Kujula Kadphises, or the son of Vima Takto himself. Either way, he was a great conqueror and he expanded the borders of his kingdom to the edges of China and Persia. He ventured into India and established his kingdom as far as Punjab and parts of Uttar Pradesh. 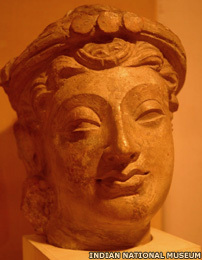 Kujula Kadphises had embraced Buddhism, while his son, Wema, embraced Shaivism (Hinduism). He also struck many coins that have imprints of various 'shaivaite' deities like Lord Shiva and Nandi (Shiva's carrier or bull). After Wema Kadphises died, his kshatrapas (governors) fought amongst themselves. Kanishka, the kshatrapa of Wema's eastern province, won the struggle and declared himself to be the successor of Wema Kadphises. Kanishka (variously attributed to around AD 78-98, c.112-132 or 127-147) proved himself to be a great ruler. Firstly, he annexed to his kingdom the various regions of India such as Uttar Pradesh, Bihar, Kashmir, Malwa, Rajputana, Saurashtra, and extended his rule as far as Khotan (southern India). He made Purushpura (present day Peshawar in Pakistan) his capital and appointed kshatrapas to rule his vast territories. Kanishka was a Buddhist. It was during his rule that Buddhism split into two sects, the Hinayana and the Mahayana (during the fourth and apparently last great council of the Buddhists). 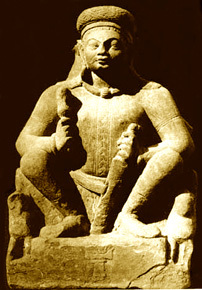 Kanishka embraced Mahayana Buddhism. The Peshawar monastery and the Stupa, built by Kanishka, was a source of admiration for many travellers, and it was during Kanishka's time that the Kashyapa Matanga introduced Buddhism to China (AD 61-67). The great scholars of the time, Ashwaghosha, Parshwa, Vasumitra, Sangharaksha, and Nagarjuna, were regulars in his court. So was the great physician philosopher, Charaka. The Greek engineer, Agesilaus, built monuments and other structures for the royals. Mathara, a shrewd politician of his age, was Kanishka's minister. 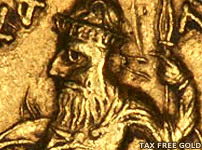 Coins minted during Kanishka's rule have been found with images of Indian, Greek, Persian, and Sumerian gods and goddesses on them. Kanishka facilitated the trade routes between India and the rest of the world, and commerce prospered during his time. There were political and trade ties between the Kushans and the Roman empire (with Emperor Hadrian), and also with the Chinese emperors. Thanks to all of this, it is easy to conclude that Kanishka's era was a golden age in the true sense. Kanishka was apparently killed by his own rebellious soldiers during one of his military expeditions to China. He was succeeded by his son, Vashishka (ruled between AD 102-106, 132-136 or 151-155, just four years). Several inscriptions have been found near Vidisha (Madhya Pradesh in central India), bearing Vashishka's name. Subsequently Vashishka was succeeded by Huvishka (AD 106-138, 136-168, or 155-187). While his parentage isn't known, Huvishka consolidated the empire, and his reign marked a greater level of control over the city of Mathura (in modern Uttar Pradesh). He practiced Hinduism and Buddhism. He was succeeded by Vasudeva I (AD 168-207 or 191-230), the last known great Kushan king. A Chinese chronicle known as Sanguozhi records Vasudeva as having sent a tribute to the Chinese emperor, Cao Rui of Wei. The vacuum created by the Chinese retreat in Central Asia was apparently filled by Vasudeva. The king also accepted Hinduism as his religion, and he may have been the Indian king who transferred the relics of the apostle St Thomas from India to Mesopotamia. After Vasudeva, the Kushana empire apparently split into two halves, eastern and western. The western kushans were overpowered by the Persian Sassanids and were replaced by vassals called the Kushanshahs, although the 'split' may have been a result of this, with the kingship moving eastwards while some of the nobility remained in the west as vassals. The eastern Kushans ruled over Punjab until being subjugated by Samudragupta, the Gupta emperor, in the mid-fourth century AD. In 360, a Kushan vassal by the name of Kidara overthrew what remained of the old Kushan dynasty and established the Kidarite kingdom (in parts of present day Afghanistan and Pakistan), while the last Kushans in India were also overthrown. The later Kushan rulers accepted Sassanid (Persian) suzerainty and Kushan power gradually waned in India.